In the first series of Jaggery Lit’s spotlight on “Artist Profile”, Srividya Ramamurthy sat down to talk with her. Below are the excerpts of our conversation. Welcome Dr. Nalini Rau, to the first edition of Jaggery Lit’s spotlight on performing artists. We are so thankful for your time. Dr. Rau: Thank you so much for having me here. I think this is a wonderful effort by Jaggery Lit to showcase performing artists in the portal. How did you get drawn to dance? Please tell us about your early days and your initial training. Dr. Rau: My mother said that I began dancing when I was 10 months old. My first teacher for Bharata Natyam was a beautiful young woman at elementary school. She taught the first few steps, but left when she got married, and the classes ended. About this time, Guru Shri K. N. Dakshinamoorthy Pillai came to teach near my home in New Delhi. My mother enrolled me in his class. We were a large group of girls. I remember that first class, Masterji came with Ms. Anne Marie Gaston and Sri Nagaraj. We did not realize at that point what a great lineage we were being introduced to: Guru K N Dakshinamoorthy Pillai, the great nattuvunar, teacher, choreographer and percussionist and the keeper of the Dandayudapani Pillai Bani tradition. He hailed from a family of nattuvunars, dancers and musicians. He was a highly trained percussionist. He had such a rich knowledge and tradition. Masterji, as we called him, was young and vibrant. I was lucky to have him. A great deal of the sound I strain to get from my own nattuvangam comes from listening to his nattuvangam. He was a strict teacher and I was an eager student, soaking in all that I could. I also learnt for two years from Mrs. Sundari Seshadri: my Guru had left us, upset, that we were not moving onto an arangetram. My mother says that he told my parents that they had a diamond which they had locked in a safe instead of showing the world. At that time, I had just begun college. I had no teacher and felt lost. Dance was my anchor and I felt adrift. Mrs. Seshadri asked me to come to her class. She also asked me to be part of her troupe. I waited another three years for my teacher to return, began training under Mr. Srinivasan in India Tidings as a trainee journalist and Art critic. At about this time, I again met Mrs. Seshadri at a recital and joined Mrs. Seshadri’s troupe. We were three dancers: Shashikala, Shoba and me. We gave a large number of recitals in Finland and a few in New Delhi. Couple of years later, she left for Bombay, with her beautiful daughter Shashikala moving on to become the actress Meenakshi Seshadri. Masterji, coincidently, returned at that time, and began to teach me again. It was an intense four years. This time around, we were able to go ahead and have the arangetram! It was an intense experience, with the orchestra coming home every day for several weeks. Much later, after I got married and had my first child, I trained with the Guru couple USK Rao and Chandrabhaga Devi. This came about because I found on my visit to India in the year 1994, that I could not go to Delhi and spend extensive time with Guru KND: both me in laws and parents were in Bangalore and did not want me to go away for an extended period. I wanted to use the time to learn and grow, rather than indulge in a round of shopping and touring. I called Masterji and asked his permission to learn from another teacher while I was in Bangalore. With his permission, I went for a two-hour class every day to Guru USK. They too were affectionate and generous with sharing their knowledge. I then spent a week in Delhi relearning from Masterji and recording music with my Guru. Years earlier, I had met Masterji when I was injured and could not dance. Now, he was overjoyed. I was not dancing my best yet, but he saw me through the eyes of a loving teacher. Masterji later fell ill. I could not visit Delhi again for over a decade. I had given birth to twins, and travel and child care was now a whole new issue. I spent several long summers learning from Guru U.S. Krishna Rao and Guru Chandrabhaga Dev, with my parents taking care of the three children. It involved two hours of travel time, two hours of class time, and a few hours practicing and going prepared for the class. They were from the lineage of Shri. Meenakshisundaram Pillai. I have been blessed with teachers who have been loving and generous with their time and knowledge. That is amazing to hear about all these great teachers and about your lineage in dance. Please do tell us about your hours of practice. Dr. Rau: I loved dance with a passion, and it came naturally to me. As a result, I went to most classes prepared. It was not work for me but play. I danced most of the time, either to music I had heard or to beats my teacher had introduced. I used to practice in my head when I was going to school or college. I remember, the first time I learnt ‘dit dit tai’, I was so enamored with the adavu/step that I danced it all the way home from the class to my house on the road. Soon our big group of dance students became smaller and smaller. At one point there were just two students, my friend Sudha Madhavan and me. Soon my teacher started teaching just me. He would come home at 5 AM and teach me till 730 AM. I would run for my Delhi University special bus, still sweating from the practice, with my breakfast toast in hand. I went to the group class in the evening couple of times a week at this time as I used to teach the younger students. After their class, Masterji would teach me. It was again an intense period of juggling graduate school work, internship in India Tidings and dance class/practice. Time appears to be elastic, as transportation to the university alone was an hour each way. Rhythm was part of you (smiles). How did the transition happen to a performer and as a teacher? Dr. Rau (smiles): I started teaching first as an assistant, taking adavu and beginner classes for my Guru. I used to teach while we were waiting for him to come to class. When I came to the US for my graduate studies, I performed at the international events and community events in the campus. I was asked to teach by some who had watched me perform. When I came back to New York, I began teaching my five-year-old daughter. One of my neighbors, Mrs. Suma Parkadavil,asked me to teach her daughters too. Soon, by word of mouth, students started knocking at the door. And they have been doing so ever since. I sat down and seriously thought about how I would like to teach and worked out a course outline. So, I introduced story-telling, rhymes, play acting and games. I wanted the girls to have fun while they were learning. I performed from the time I was four years old till I was 29, when I had an injury: I fractured my back. Once I recovered, I began to learn again and then perform and continue to perform to this day. Performing, teaching, learning has happened hand in hand. I realize more than ever how much there is still to learn: Bharata Natyam is an ocean bringing together so many streams of knowledge. I am not sure if one lifetime is enough to plumb its depths. I must add that some of my own growth has happened in interaction with the artists of our orchestra, and interaction with several dancers it has been my privilege to know. I owe a great deal to my parents too. And that’s how the dance school “Natya Anubhava Dance Academy” was born? Which year was that and how many students have you trained? Please do tell us a bit about the arangetrams and performances. Dr. Rau: Yes, the school began in the summer of 1993. We just had our 25th anniversary. I have trained over 150 students. About thirty students have completed their arangetrams. I do not insist that a student must perform an arangetram. I also give the family several options to choose from to suit their budget. Once they choose a live orchestra, some costs become inevitable. I have worked hard at letting the parents decide how much they spend. A student must go on stage only when s/he is able to perform at her very best. The journey is as important as the goal. As for performances, I have performed as a dancer and as a nattuvunar in various venues: the Lincoln center, Madras Winter festival, the UN, ArtsWestchester, Paramount Theater,Finlandia Talo, New York City Hall, AKKA, Music Hall,World’s religious conference in Queens NY,museums and schools, universities including Jewish Museum, Pelham Art Center, Hammonds, Krannert, Bryn Mawr, University of Illinois. What are some of your dance productions? Dr. Rau: Devi Saraswathi, Naukacharitramu, Nari,Jivan, Dasha avatara,Krishna, Govinda Kathe, Sittaya, Agraani, I presented some of my poetry through dance. I have also collaborated with other artists of other genres as in the project Her Stories (Curator Bibiana Huang Matheis) at Arts Westchester and Akin Museum. Arts Westchester of New York, while celebrating their 50 years and honoring 50 artists, awarded you an honor. You were chosen for your Choreography. Congratulations again on that! Can you tell us a bit about your influences on your choreography and about how these above productions came to life? Dr.Rau: My dance ballets and productions are influenced by contemporary issues and things which touch my heart: such as gender and equality issues, corruption, war, strength of women. Naari was based on strength of women. Sitayana retold the story of Sita as a powerful strong person. Agraani told the story of women trail blazers. We showcased how women have overcome real struggles and helped themselves along with helping the community. Govina Kathe was based on respect for universal values. Jivan dealt with the flow of life, and how it is possible to transform oneself and grow. I created and performed a dance on my great great great great grandmother who fought her way out of the rubbles of a fallen Vijayanagara empire in 1565 and trekked from Anegondi to Mysore with protecting the womenfolk and children of her family. Wow! All of these showcased with a dance form that is thousands of years old. Dr.Rau: Yes, it is very much possible to do that. The style itself has so much depth and gives us so many tools. It is a meta language. The jathis (Rhythmic patterns) can be used in the time-honored manner in pure dance. I have used them to create a mood or interpret a nuance in a story. When I do not have a song, which expresses what I want, I create a script or interweave the poems I write into the dance productions. This has been for themes where I could not find suitable music, such as the themes of gender equality. However, many of my ballets have retained the traditional interpretations as in Devi Saraswathi, Krishna, Dasavathara, Geeta Govinda and Nauka Charitramu. Well-deserved award indeed! Tell us a little bit about your other awards and recognitions. Dr. Rau: My best awards have been the drawings my little students have given me where they say they love me and love dance. And my students who dance really well and yet have the humility to know they can do better and know that they did not come out of the void. And a parent telling me how much the journey with me has meant to them. To my mother’s delight, there have some awards and recognition from the Arts community: With my Guru’s grace, under the auspices of Natyakalayam, the award of Natya navaratna from the President of India, 50’ 50’s from Arts Westchester, recognition from IACAW in Nov 2018 for contributions made to the Westchester community, and a few accolades from the county office. Incredible! But that is not all about you isn’t it? You are a linguist as well. You received a Doctorate in Theoretical Linguistics from University of Illinois, Urbana-Champaign. You received the Uggrasein Award in Linguistics for being a gold medalist at Delhi University. That is power packed! Before we end this wonderful conversation, what would your advice be for young children and dancers out there? Dr. Rau: Treat your body and mind well. Have a regular discipline in your practice. Be truly respectful and loyal to your teacher and to the Artform. Aim for the stars and do your best. Enjoy the dance. My best wishes and love to all of them. 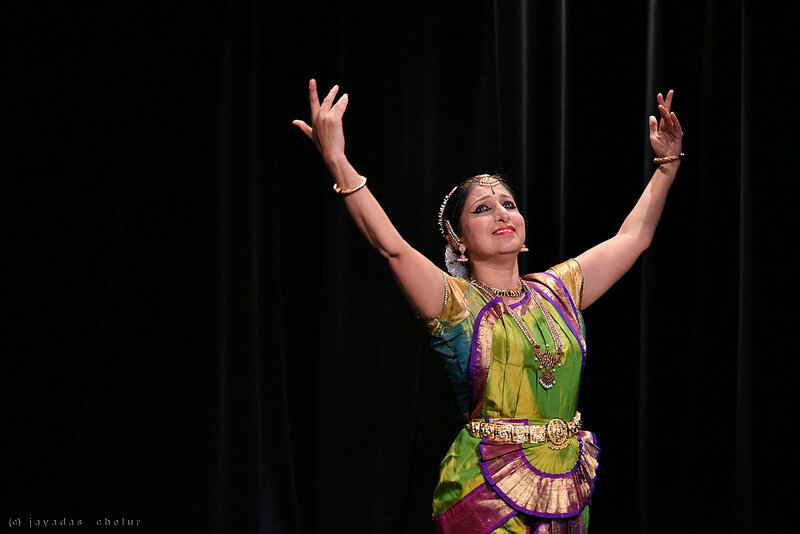 Dr. Nalini Rau is a leading dancer, teacher, and choreographer of BharataNatyam. BharataNatyam is an ancient classical dance form.